When you think Las Vegas poker, one of the first things that pops into your head should be the glitzy neon lights of the “Downtown” Vegas landmark, Binion’s Horseshoe Casino, which is celebrating its 60th birthday this year. Binion’s was the brainchild of Las Vegas mogul, and one of the original casino barons, Benny Binion, and the site has played a historic role in shaping the poker world. 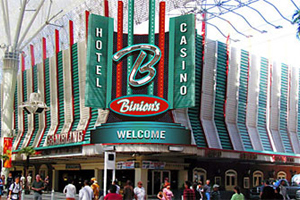 The earliest mentions of Binion’s and poker was when a match was setup by Benny Binion, pitting his long-time friend Johnny Moss against legendary gambler Nick “The Greek” Dandalos –although as James McManus points out in his book Cowboys Full, it’s still not clear whether this match took place, or if the amounts involved and length of time are accurate. Later the casino became known as the home of the World Series of Poker, and the most famous poker tournament series in the world, which was created in 1970, was held at Binion’s up until 2005 when Harrah’s –which purchased the WSOP brand in 2004—moved the WSOP to the Rio. Binion’s remains a local landmark in Las Vegas, and even its location in “Downtown” Las Vegas (also known as Glitter Gulch) doesn’t keep the tourists from venturing far away from “The Strip” to play at Binion’s, or have their picture taken with the infamous million dollars in cash housed behind an insanely thick hunk of Plexiglas in the Casino lobby. So congratulations to Binion’s casino on hitting an unheard of milestone in Las Vegas, where buildings go up and are torn-down in a matter of a few years, 60 years at the same location! This entry was posted on Wednesday, August 17th, 2011 at 9:52 am and is filed under Poker News. You can follow any responses to this entry through the RSS 2.0 feed. You can leave a response, or trackback from your own site.